Beat the egg and dip the chicken breasts into the egg wash.
Dust the coconut flour over the chicken breasts. Bake in oven until browned and cooked through for about 30 minutes. 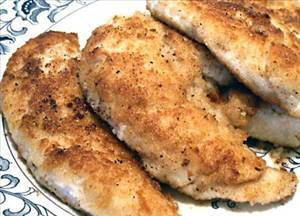 There are 361 calories in 1 serving of Coconut Crusted Chicken Breasts. Calorie Breakdown: 38% fat, 2% carbs, 59% prot.